Oh look - a squirrel! 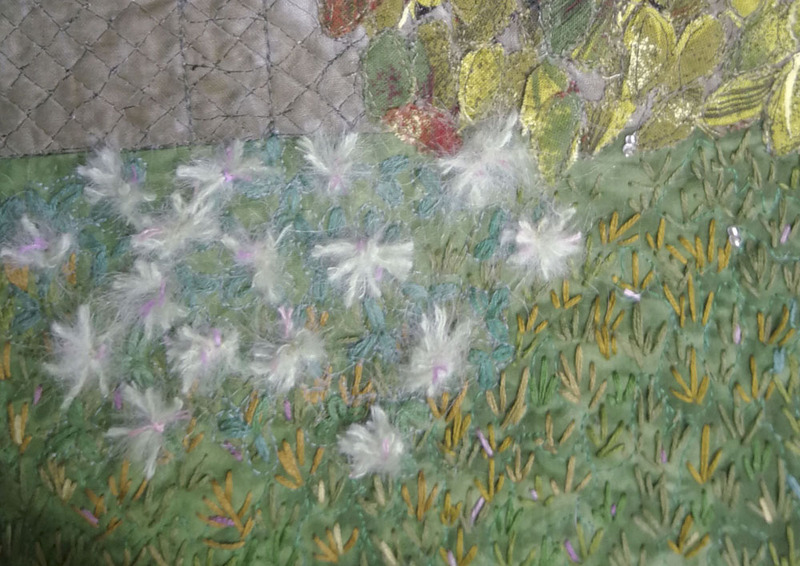 This month I worked on another squirrel project, a small art quilt this time. A few weeks ago, as is our routine, Chevy was taking me for a walk in the early dusk. It was a lovely evening. On our way back to the house I was enchanted by a patch of clover backed by vines of dark leaves cascading from the fence and the blinking lights of a couple of fire flies. I took a few minutes to admire it and then home we went. 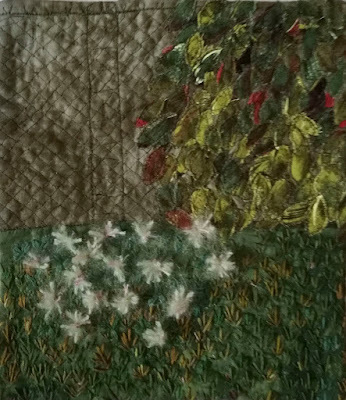 By the time I got home, I was thinking that I had to capture the moment in a small art quilt. I sketched a rough image and the next day went back to check out some of the details. 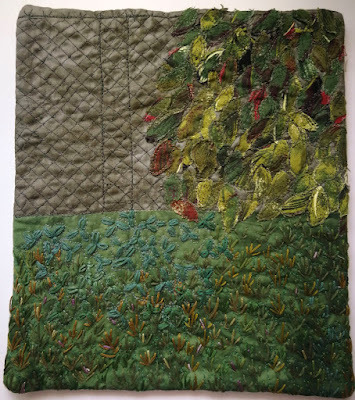 And that's how the Clover at dusk art quilt became a squirrel (i.e. an unplanned project - Drop Everything And Make it!) to be posted in the Dreami! linking party. 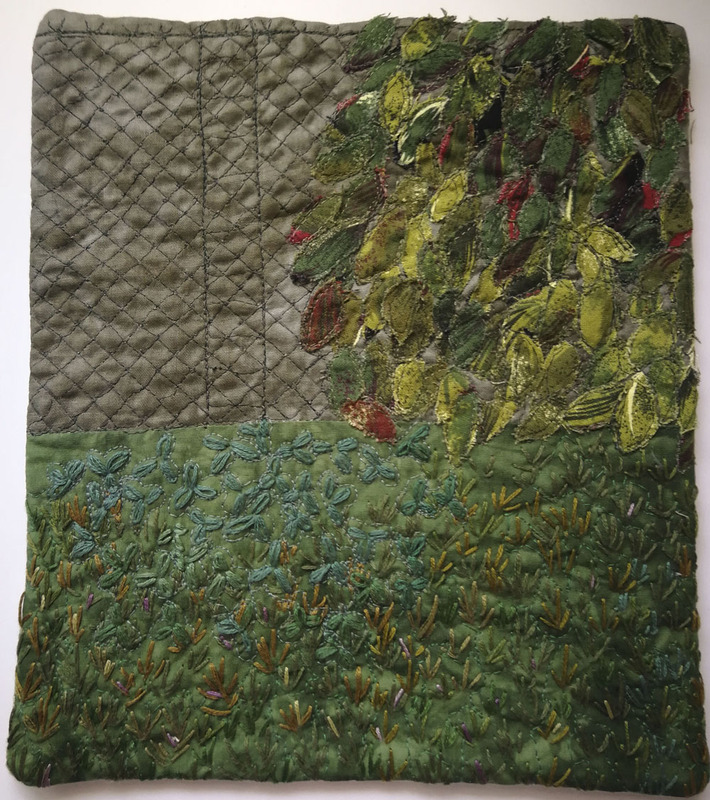 After choosing two hand-dyed fabrics from my stash, I cut up some leaf fabric and glued the leaves onto the piece. 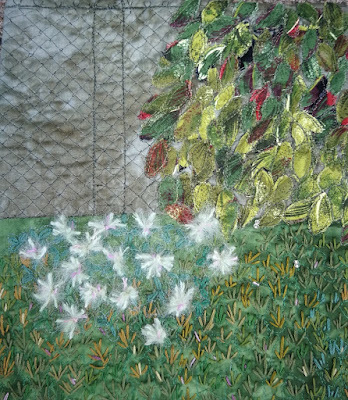 After stitching them down with FMQ, I drew in the fence and FMQ it. The next step was the embroidery of the clover and grass. I used the lazy daisy stitch for the clover leaves. The embroidery took a couple of enjoyable evenings as I listened to audio books. I then added the batting and FMQ around the clover and in the grass, as well as around the leaves and the outline of the fence. I knew that I wanted to use fuzzy wool to make the clover flowers. I played around with the wool and embroidery floss and came up with these. Clover added to the Clover at dusk piece! Here is a close up of the clover. Close up of the clover flowers. Finally came the time to add the fire flies - a couple of shimmering off-white beads did the trick. There were many lessons learned in this wonderful mini project. Because it was unplanned and small, it was much less intimidating than most projects - just an idea and the challenge of making it in cloth! Behind the hand-dyed fabric, I used an interfacing that I found in my stash. I'm not sure what kind it is, but I'm going to look into it because I really like it. The internet is really a great aid. I just found some generic pictures of metal fences and the clover flower to help me with the details. 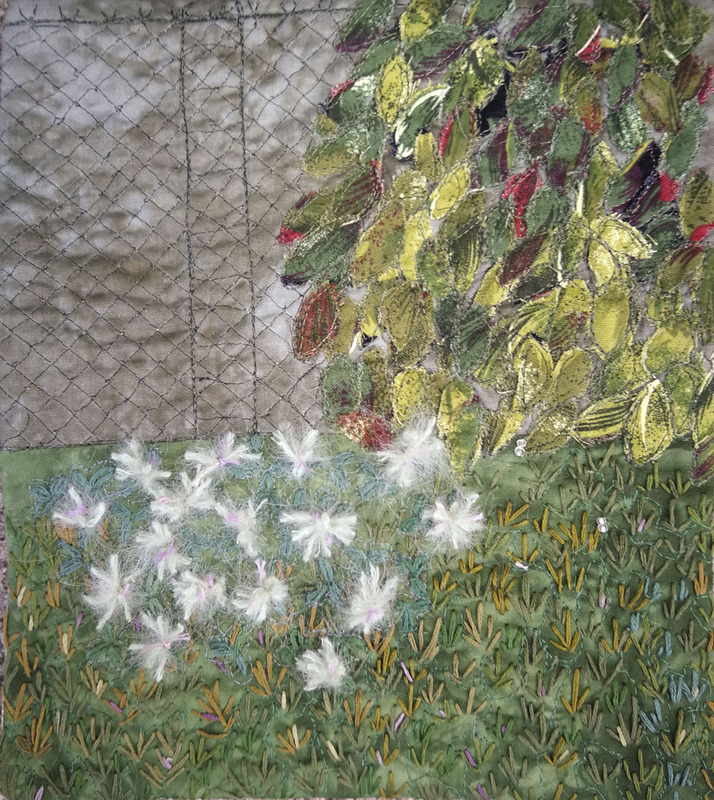 I wanted to add a little colour to the grass and found a variegated embroidery floss with some of the greens of the grass that also a little beige and purple. It worked in really well. I make it sound easy in the description of my process, but I was tired and it took me three tries to get the backing on correctly...I kept sewing the fabric right-side up! Great News! 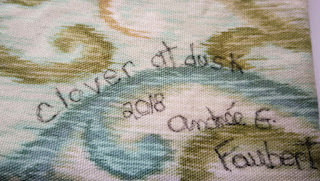 Clover at dusk was featured in Sandra's August Dreami! at mmm! Quilts. Thanks Su-sie!Mac. Glad to meet you. I just checked out your Hollister blog. That is so cool. 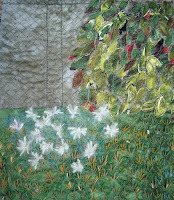 Hope you enjoy art quilts - there's so much out there. Don't you just love those moments when something seemingly insignificant catches your eye, which in turn can be created into a beautiful piece of art?! Small projects are definitely less intimidating and I am very glad that you were able to go back the next day to see the all the details. You captured them so beautifully in your mini. It is lovely! Hi Soma, thanks for hosting it :-) I guess that's what art and photography (one of the arts!) is all about. Seeing something special in everyday things. Small projects are really great for experimenting since there's really nothing to loose. I've also been enjoying your paintings. That is a really pretty, dreamy piece - well done! Thanks Susan. Now that I'm reading it, it's exactly what I was going for - dreamy. Thanks!!! Hi Dione, I've been told that there are lots of fireflies around this year - not sure why. I see a few every once in a while when walking Chevy. They always make me do a double take because you tend to see some flickering from the corner of your eye. Hope you get to see some someday. Those darn squirrels LOL It's a great mini. Thanks for linking up with Thank Goodness It's Finished Friday (TGIFF). Your art quilt is beautiful. thanks for sharing with Moving it forward. Thank you so much Em. What a wonderful spontaneous project! Shame about the neighbour and the spontaneous lawn mowing, but you knew what you had seen and had to sew it. The fire flies made you do it! 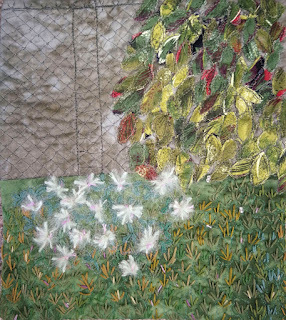 Hi Andrée, I just spotted your wonderful Art Quilt over at Anja’s blog. 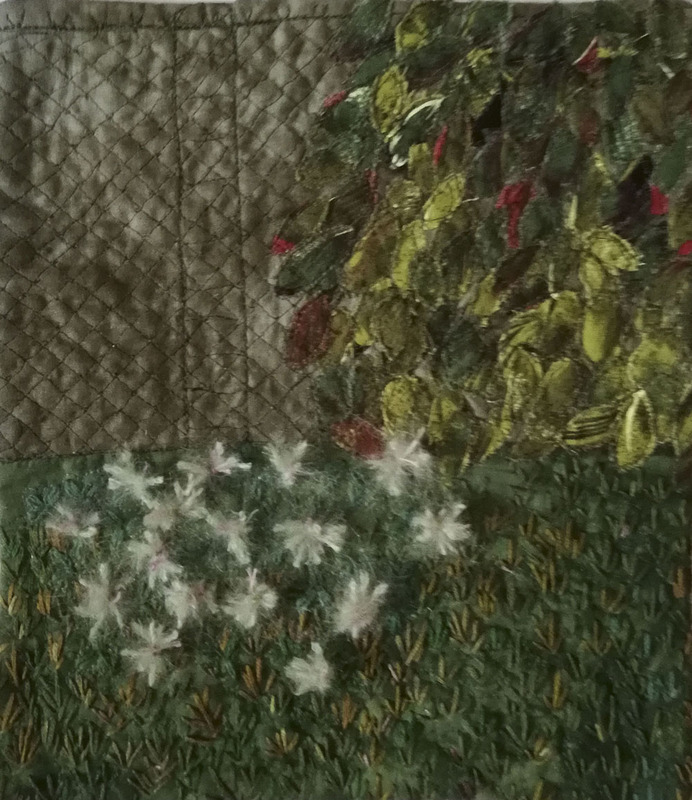 I’m fairly new to quilting but I am taking part in an Art Quilt challenge in a group called The Endeavourers so I was really interested when I noticed “Clover at Dusk” ..... its amazing and looks like it really glows!